Product #60580 | SKU CINECAMPOCHDXBT | 0.0 (no ratings yet) Thanks for your rating! A deposit of $40.00 is required for this pre-order. 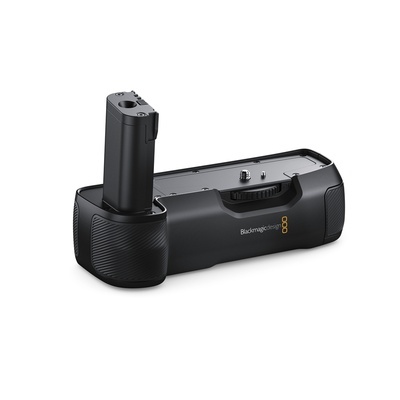 Designed for the Blackmagic Pocket Cinema Camera 4K, the new Blackmagic Pocket Camera Battery Grip lets customers replace the camera’s standard LP-E6 battery with two L-series batteries so they can shoot for over 2 hours on a single charge. It’s perfect for anyone that needs to shoot for extended periods of time. Featuring a unique carbon fiber design, non-slip hand grips, and a slide out tray that holds 2 L-series batteries, the Pocket Camera Battery Grip also makes it easier to hold the camera on longer shoots. L-Series batteries are standard batteries used for a variety of professional lighting equipment, so they’re readily available. Customers can even charge the batteries in the grip via the camera’s 12V DC connection in between takes.